Here we have answered some frequently asked questions about Assessments. Click on the question to reveal the answer. What is the Passing percentage for each assessment and how it is calculated? The passing percentage is 80% for each assessment. If you do not pass an assessment, you need to take it again until your passing percentage is 80% or more. For some lessons the passing percentage for each assessment is 90%. Do not worry, if you do not pass an assessment the first time. You can re-take the assessment as many times as required. Alternatively you can go through the lesson again before re-taking the test. Note: If they are more than one assessment for a lesson then you would need to pass all of the assessments for that lesson before you are qualified to move to subsequent lesson(s). How a question is marked as correct? Note: The right answer is highlighted in green color. Whereas the wrong answer is highlighted in red color. How a question is marked as incorrect? #1 A question is marked as “Incorrect”, if you selected the wrong answer(s). #2 If you selected the right answer(s) along with the wrong answer(s) then also the question is marked as incorrect. Note: A question can have more than one right or wrong answers. How to take an assessment? You have to answer each question before you can move to the next question. You won’t be able to move to the next question if you try to skip a question. You must complete an assessment in one sitting. We do not save your answers, so if you click on the browser ‘refresh’ button in the middle of taking an assessment or if you navigate to another web page or close your browser window in the middle of taking an assessment then you may have to retake the entire assessment. How to submit an assessment? If you do not click on this button then your assessment can not be evaluated and you may have to retake the entire assessment again. How do I know if I have passed an assessment? 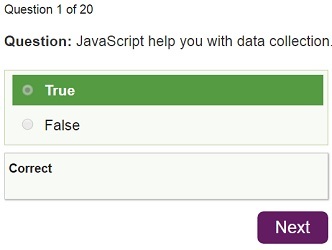 Once you have passed the assessment, you will see the ‘Click Here to Continue‘ button. How do I know if I have not passed an assessment? #3 If you have not passed the assessment, you will not be able to take subsequent lesson(s). How to retake an assessment? You can retake an assessment as many times as you like. 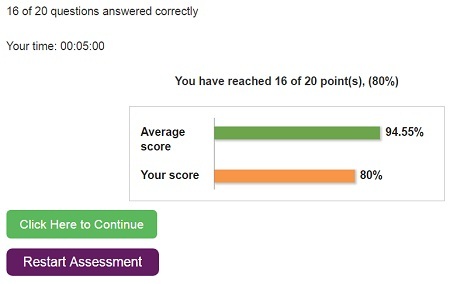 You can retake an assessment, even after you have passed it once, just to improve your score. However retaking an assessment once you have passed it, is optional. Note: If you want to restart an assessment in the middle of taking it then just refresh the assessment page in your browser window.